EXCEED AND EXCEL (AUS) (Bay 2000-Stud 2004). 7 wins-2 at 2, VRC Newmarket H., Gr.1. Champion Australian Sire 2012-13. Sire of 1878 rnrs, 1321 wnrs, 152 SW, inc. Excelebration (Deauville Prix Jacques Le Marois, Gr.1), Overreach, Guelph, Mr Stunning, Earthquake, Margot Did, Amber Sky, Flamberge, Helmet, Reward for Effort, Outstrip, Sidestep, Fulbright, Best Terms, Heavy Metal, Priceless, Championship, Kuroshio, Masamah, Wilander, James Garfield, etc. Freeze Over (f. by Exceed and Excel). 3 wins. See below. Big Night Out (c. by Lope de Vega). Winner at 1150m in 2018-19 in Aust. BIG CHILL (Artie Schiller). 2 wins. See above. HARD STRIDE (Street Sense). 8 wins to 1200m, A$664,115, to 2018-19, MRC Regal Roller S., L, Taralye-Deaf Kids Talking H., BRC CJA Produce Division H., Buy a Bale H., VRC Tab.com.au Trophy, 2d VRC AR Creswick Series Final S., L, VOBIS Gold Ingot 2YO S., MVRC Essendon Nissan H., 1print.com.au P., Adapt Australia H., MRC Charter Keck Cramer H., BRC Qld Accounting Group H., 3d MRC Heath S., Gr.3, VRC Kensington S., L, BRC Bribie H., L, 4th VRC TAB Rewards S., Gr.3, MSS Security S., L, BRC Keith Noud H., L.
UTAH SAINTS (God's Own). 5 wins to 1400m, A$353,225, MRC Anniversary Vase, L, Pin & Win for Epilepsy H., VRC Williamstown H., 2d MRC Regal Roller S., L, BRC Hinkler H., L, MRC Premier Signs P., Barry Poynter H., 3d VRC Sofitel H., L, MVRC Abell S., L, VRC Elms H., MRC BTB Australia Directional Drilling H., BMW H., Sale Cup, VRC Smithfield H.
Leather'n'lace (Street Cry). 3 wins to 1400m, A$221,500, in 2017-18, MRC Aquis Farm Supports Pinchapoo P., 2d MRC Kevin Hayes S., Gr.3, 3d VRC Edward Manifold S., Gr.2, MRC Honan Insurance Group H., Comcater 2YO P., 4th SAJC Proud Miss S., Gr.3, Geelong RC Shojun Concrete S., L.
Rough Justice (Wanted). 6 wins-1 at 2-to 1300m, A$565,890, MRC Pancare Foundation P., VRC AR Creswick Series Heat H., Red Tempo H., MVRC Jeep 55 Second Challenge Heat H., Wangaratta TC Crownbet Vobis Gold Eldorado, 2d MRC Weekend Hussler S., L, VRC Schweppes Flemington Fling S., Emirates Airline H., Bruce Gadsden H., Western Health Pharmacy Cup, 3d VRC AR Creswick Series Final S., L, Dalray H., Country Achiever Gerald Egan H., MVRC Gold Carat, MRC Sheen Group H., 4th VRC All Victorian Sprint Final H., L, MRC WJ Adams S., L.
Hardbreak Hotel. 6 wins from 1100m to 1600m, A$219,140, ATC Summer Super Saver Ticket H., Warwick Farm 100 Club H., Comfort Inn Hunts Liverpool H., AJC Galaxy Dining Room H., 2d ATC James Boag H., Lawler Partners H., STC Goldners Horse Transport P., 3d ATC Tony Patramanis H., AJC Corporate Membership H., STC Hyland Race Colours H.
If Not Now When. 2 wins at 2, A$325,700, Cranbourne TC Inglis Vobis Gold 2YO P., Bendigo JC Gold Rush 2YO S., 2d MRC Changing Places Real Estate H., Alice Mosley H., 3d MVRC Bidfood H., MRC Henry Dwyer Racing H.
Lago Rider. 3 wins at 1600m, 2100m, WRC Gibson Sheat Lawyers H.
Hard Rider (Maroof). 2 wins. See above. All You Wish (Thorn Park). Champion Griffin in Hong Kong in 2012-13. 7 wins from 1200m to 1600m, HK$7,763,750, M$105,000, HKJC Moon Koon H., Chevalier Cup, Hong Kong Owners 35th Anniversary H., Racehorse Owners Association H., Citibank Insurance H., Lady Jules Audemars H., Granville H., 2d HKJC Chinese Club Challenge Cup, L, Long Valley H., 3d HKJC Chinese Club Challenge Cup, L, Chevalier Cup, Ma On Shan H., 4th HKJC National Day Cup, Gr.3, Bauhinia Sprint Trophy, L, Hong Kong Classic Mile, L.
Race Record: 15 Starts 3-1-5 A$168,300. 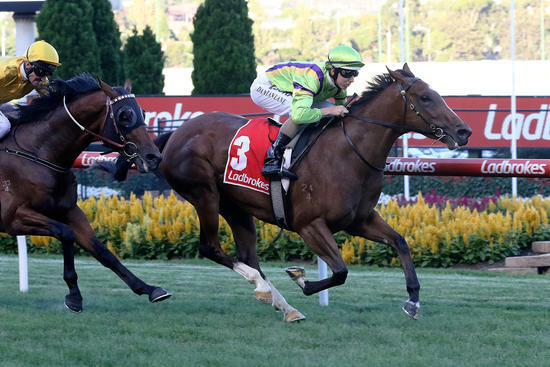 3 wins-1 at 2-at 950m, 1000m, A$168,300, to 2018-19, MRC Spicer Thoroughbreds 2YO H., MVRC Ladbrokes 55 Second Challenge H., Nelson Alexander H., 2d VRC Phar Lap Club 2YO P., 3d MVRC Ladbrokes H., United Refrigeration H., Musk Creek Farm H., MRC Polytrack H., Bendigo JC Jarrod Larkin Concreting H., 4th VRC Incognitus S., L.